That's great Aqua Admin Matt, I'm sure you guys are a cute couple. I appreciate the intention, Aqua Admin Matt, and to be honest you are totally my type, but a few problems. First, you work for a misguided evil organization. 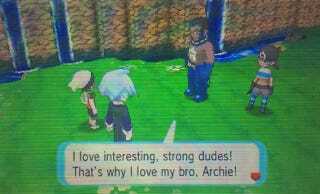 Second, I'm pretty sure you just told me you love Archie, and I'm not down for an Aqua à Trois. In all honesty, I know that wasn't the intention of the conversation in the game, but I couldn't help but take it that way, if only to fuel my inner fan-fic. Really, Matt would totally be my type.